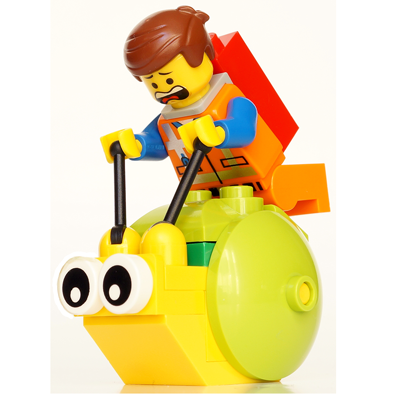 Emmet Brickowski is the main character of the 2014 movie…The Lego Movie. He is a construction worker who somehow gets mistaken as being ‘The Chosen One’. In this picture he is riding the giant snail and he doesn’t seem to be enjoying it. lol. 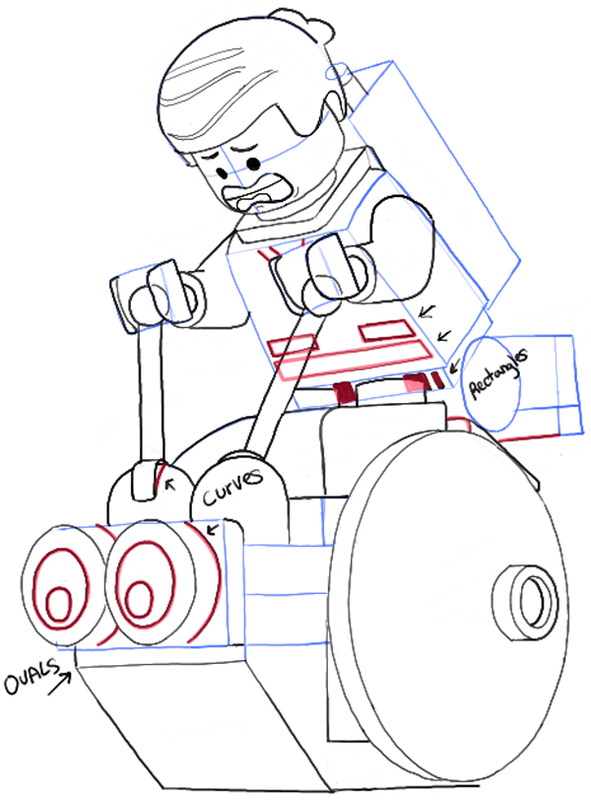 Anyways, I will show you how to draw Emmet and The Giant Snail in this step by step drawing tutorial. Have Fun! 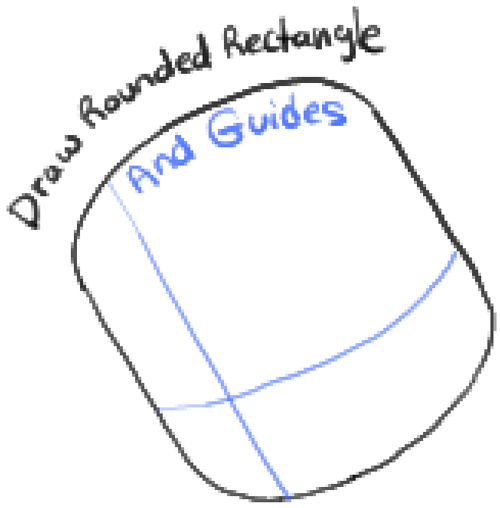 Draw a rounded rectangle-like shape. Then draw guides thru it as seen above. These guides will help you place the facial features later. 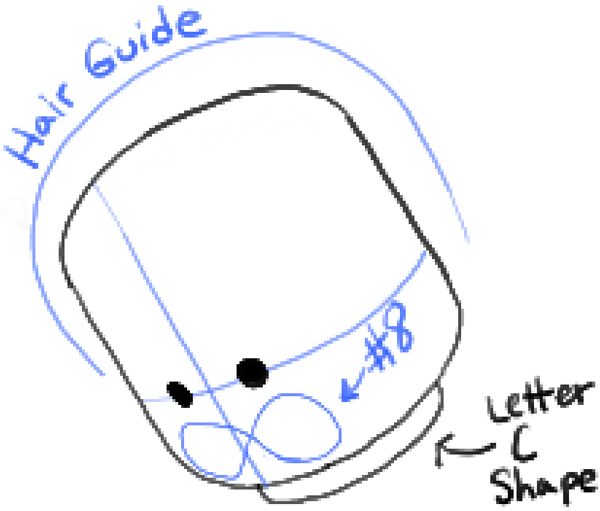 – Draw a half-circle around the head as the hair guide. – Draw the eyes – one circle and one oval. 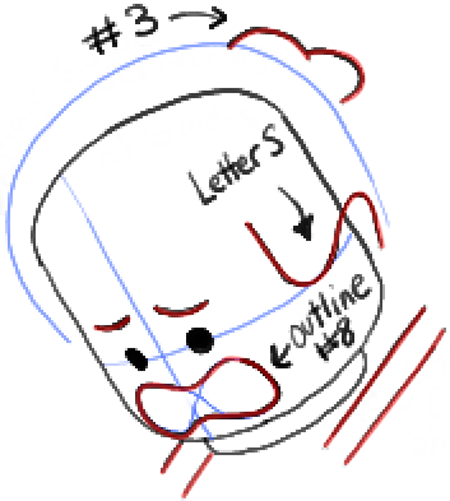 – Lightly draw a sideways #8-like shape for the mouth. – Draw a sideways letter ‘c’ shape for the neck. – Draw a #3-like shape on top of the head. – Outline the shape of the mouth. – Draw a sideways letter ‘s’ shape on the right side of the head. – Draw a few straight lines. – Draw a line across the mouth and a sideways #3-like shape for the tongue. – Draw a few curved lines for the hair. – Draw 2 sideways letter ‘L’ shapes around the neck. 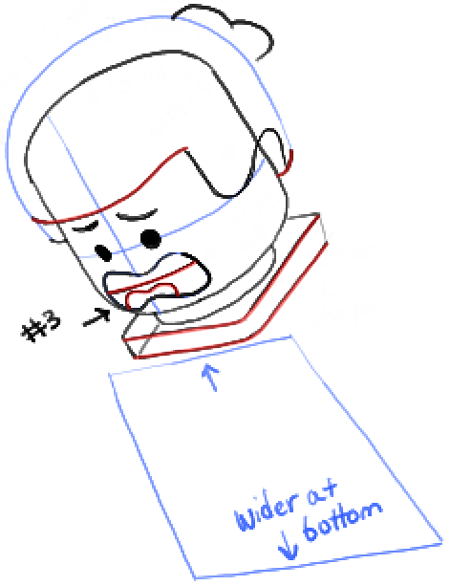 – Draw the body … a rectangle that was wider at the bottom. – Draw sideways letter ‘s’ shapes in the hair. 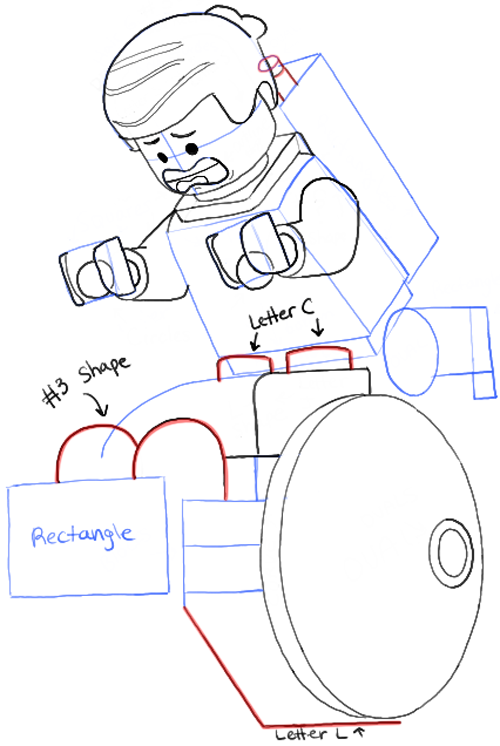 – Draw a few rectangles for the side of the body and the backpack. 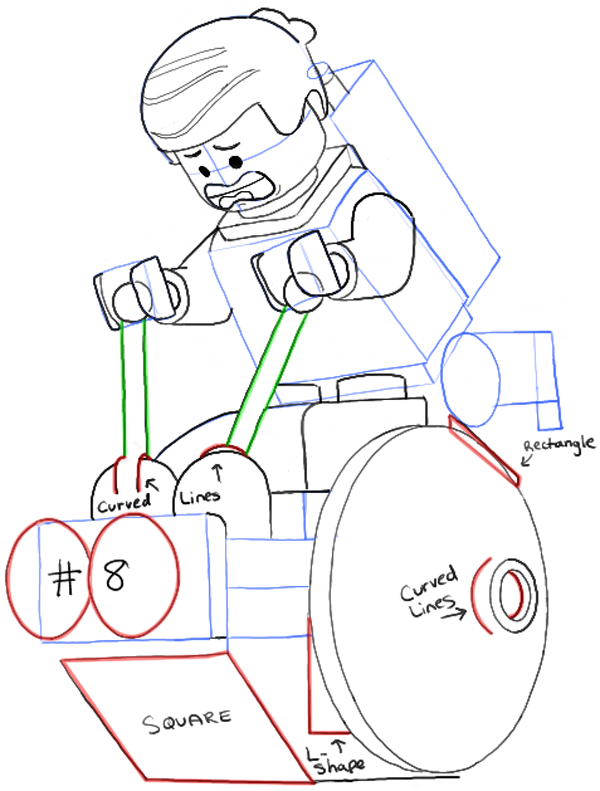 – Draw sideways #9-like shapes for the arms. – Draw an oval on the back of the head. – Draw a few rectangles. – Draw sideways letter ‘D’ shapes in the hands. – Draw sideways ?-like shape for the top of the right arm. 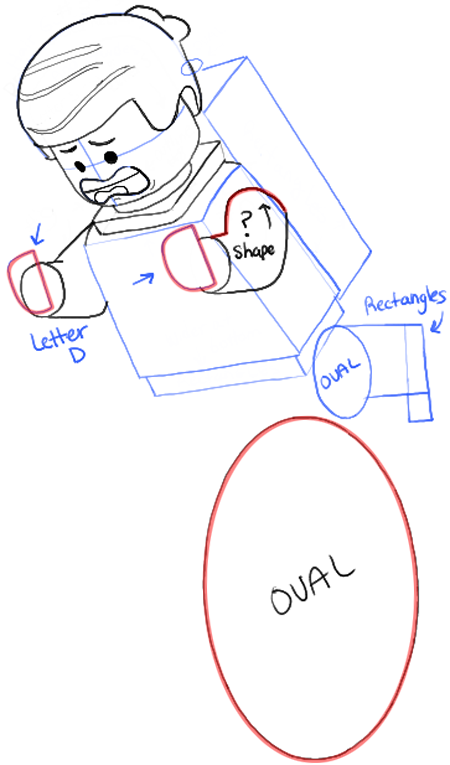 – Draw an oval and rectangles for the back foot. 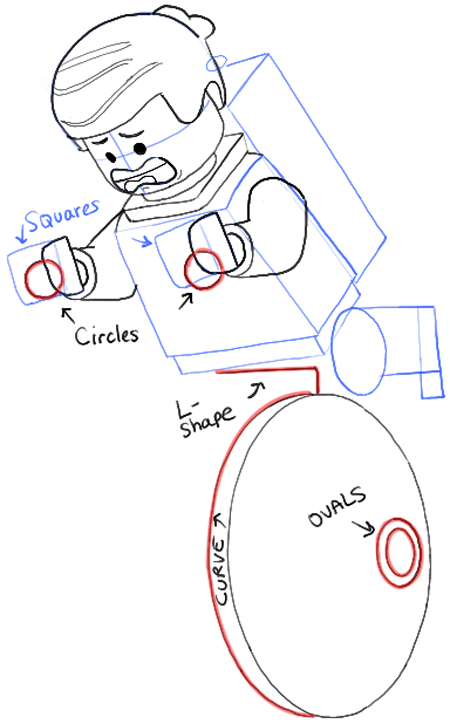 – Draw a very large oval below Emmet. – Lightly draw squares for each hand…draw a circle in each hand. – Draw a sideways capital letter ‘L’ shape below his waist. – Draw ovals inside the huge oval…also draw a curved line along the outer-left edge to make it 3-dimensional. 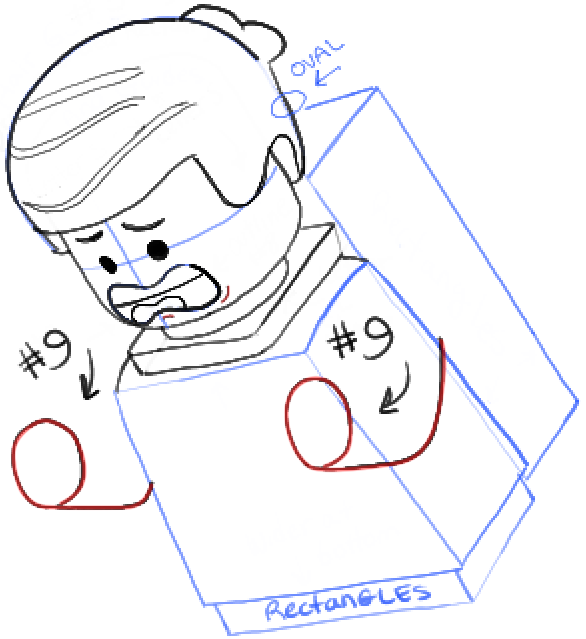 – Draw a curved line along the back of Emmet’s neck. – Draw an upside down letter ‘J’ shape below his waist. – Draw an oval…a curved line…and a few straight lines on the backpack. 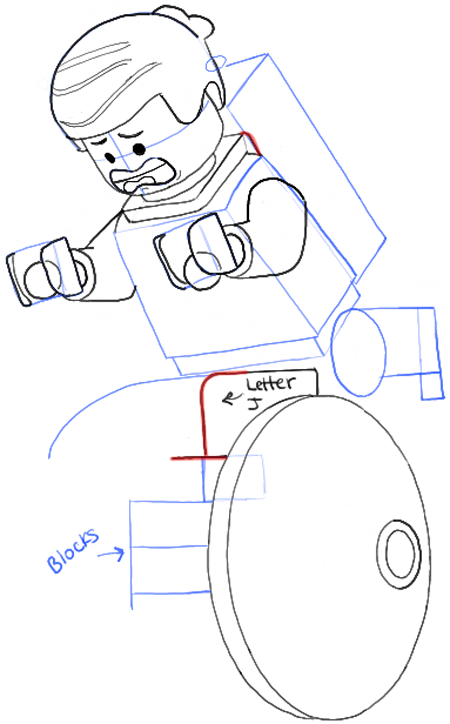 – Draw 2 sideways letter ‘c’ shapes in front of Emmet. 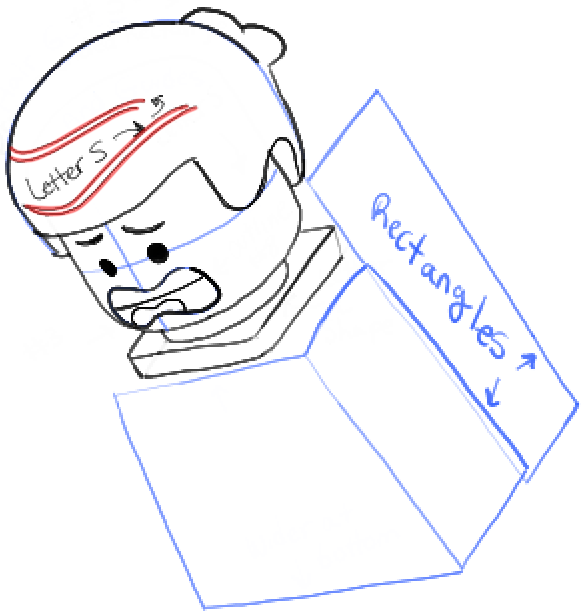 – Draw a sideways #3-like shape above a rectangle. – Draw a letter ‘L’ shape on the left side of the huge oval. – Draw 2 lines down from each circle that is held in each hand. Connect it to one of the humps on the #3-shape that you drew in the last step. Then draw curved lines below them. – Draw a sideways #8 like shape for the snail’s eyes. – Draw a slanted square shape below the eyes. – Draw curved lines within the huge oval…and a rectangle on the upper-right corner of the circle. – Draw ovals inside the eyes…and curved lines at the right-side of the eyes. 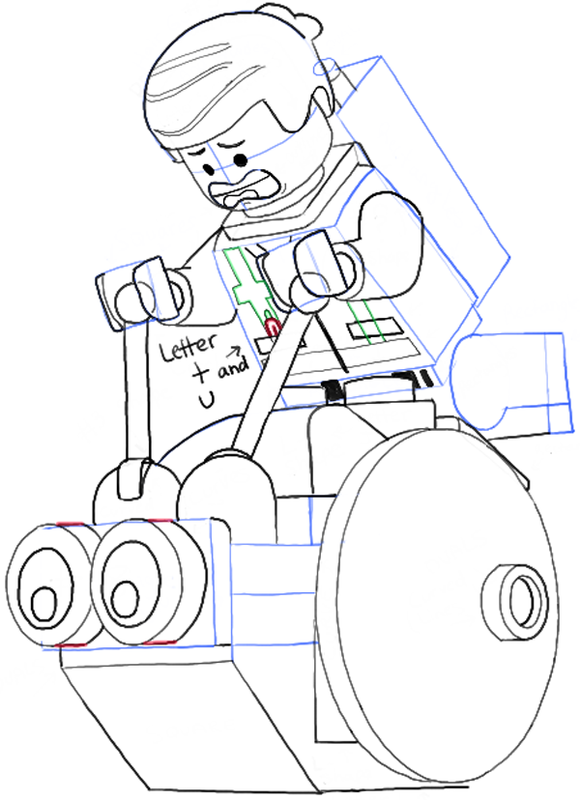 – Draw a few rectangles on Emmet’s chest…and a few lines on the top of the shirt. – Draw a few lines. – Draw a bubble letter ‘t’ shape on the shirt…as well as 2 upside down letter ‘u’ shapes. – Draw 2 lines on each eye. – Erase any guidelines that aren’t needed any more and darken or thicken any lines that help. I hope that your drawing turned out great and that you enjoyed our tutorial. Come back for more drawing lessons! 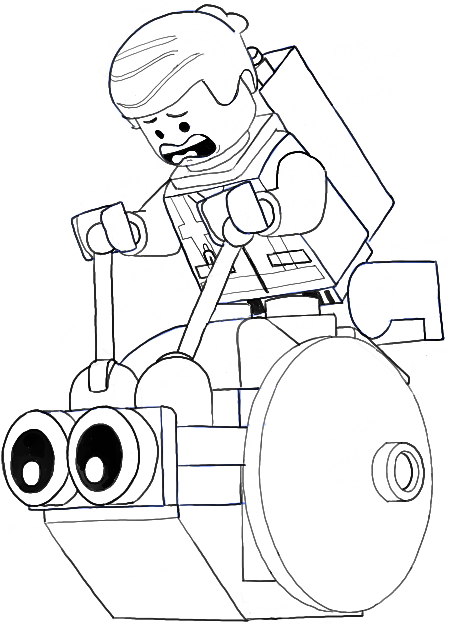 This article was written on 28 Feb 2014, and is filled under Lego Minifigures, The Lego Movie.